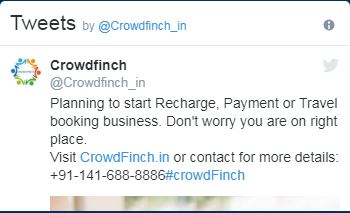 Crowdfinch is known for their best mobile recharge API services in India, which provides all network recharge services with a maximum commission on minimum investment. Crowdfinch is a B2B portal. which various an API services. We provide API to our clients to use all of our services on their portal or applications. We allow prepaid, postpaid, utility recharge services which include mobile recharge, Electricity bill payments, Data card recharge, DTH recharge etc. Crowdfinch’s main focus is to provide the best service to our clients. Our mission is to generate more entrepreneurs in India. We provide 24X7 customer supports for best service and to achieve our mission. 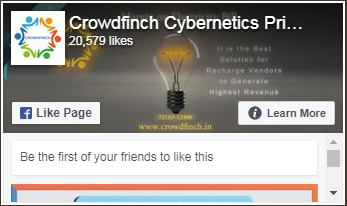 Crowdfinch Cybernetics Pvt Ltd is a technology driven, employ supportive, client-centered, result-oriented API service provider and software Services Company based in Jaipur Rajasthan. So if your developer having any problem to set up our API on your portal or mobile APP then our team will be always there to support them. Crowdfinch provides out of the box support for you. We also provide an API service with a good designed error-free website which all testing. That is ready to use for you. What do you need to do? Just start selling your product to your client and start digital marketing. You should have a legal entity to start the business in India with GST Number. Integrate API code and limit your amount in your account then trained your staff and get the instant commission on every recharge of customer mobile, data card, DTH or bill payments. Crowd finch API includes all Indian Mobile network companies like Jio, Vodaphone, Idea, Airtel, Aircel, MTS, MTNL, BSNL, Reliance, Tata Docomo, Uninor, Videocon, Telenor and DTH operators like Dist TV, Tata Sky, Sun Direct, Airtel Digital TV, Videocon d2h, Reliance Digital TV and Internet data card/WIFI dongle service providers like BSNL, MTNL, Tata Photon, Aircel, MTS, Reliance, NetConnect, JIO etc. Make your recharge system easy, cost-effective and profitable with the best mobile recharge API provider in India Crowdfinch.